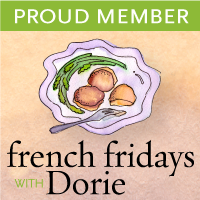 Gerard’s Mustard Tart is this week’s French Fridays with Dorie recipe. 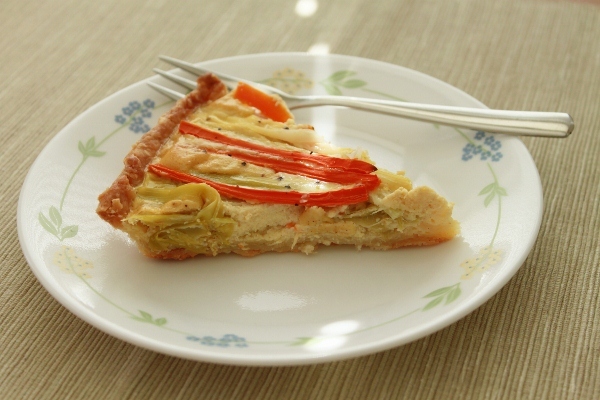 It’s a savory tart that has a buttery crust and a filling made of eggs, cream, milk and mustard. 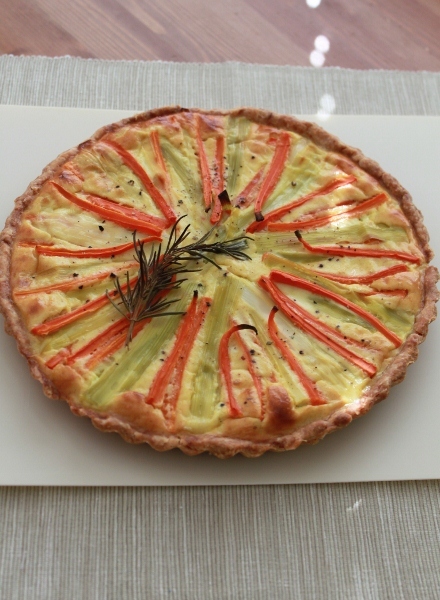 Steamed leeks and carrots top the tart. I was nervous about making this as it involves making a pie crust. I can count on one hand the number of times I’ve made pie crusts. While I have no issues with the making of the dough, I find rolling it out tricky… and messy – flour everywhere and a dirty counter surface to clean up after. I made the dough with a pastry blender and it came together quite easily. I chilled the dough overnight and rolled it out the next day in a pie crust maker. It was very easy to use and the best thing is there’s no big clean-up job. Just wash the bag! Dorie said to roll the dough out to at least 12 inches in diameter but I find my dough just making it to 12 inches. I suppose I could roll it out another inch but I was worried about my dough being too thin. I transferred the dough to the tart pan and was careful not to stretch it, lifting and dropping instead of pulling. I freeze the dough overnight before baking it today but to my disappointment, the dough did shrink about 1/4 inch. I must have stretched it somehow. Can someone tell me please, how do people roll out large, supple dough?? However, I’m pleased with the end result. The tart looked rustic and the taste was good. I got to admit I’m not crazy about this tart as I’m not a big mustard fan but I still ate 2 slices. Love the crust! I used only (Maille) Dijon mustard as I didn’t have any grainy mustard. This is the first FFwD recipe, whee! The recipes for October were selected by Dorie herself. I suspect she chose this as the first one because it’s a simple recipe and thus will give us all an encouraging start! 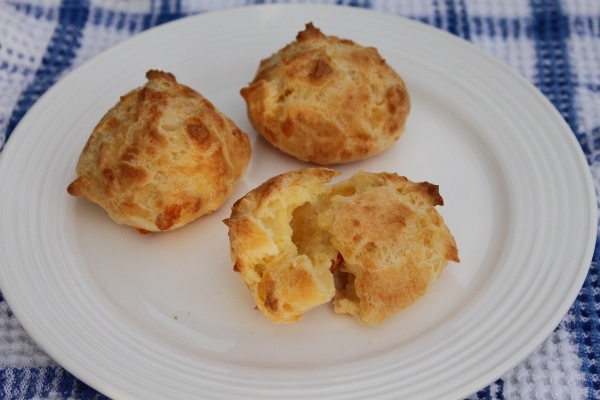 Gougères are French choux pastry with cheese. 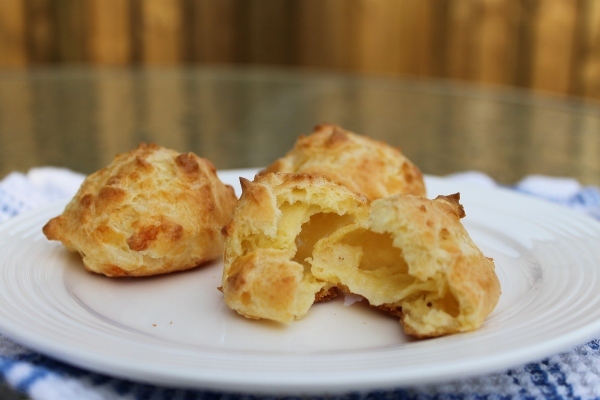 Think profiteroles but instead of sweet and with cream filling, it’s savory and cheesy with no filling. They are very yummy especially when warm. Big Kid tells me it’s pronounced ‘goo-cher’ but I just say ‘cheese puffs’. This is my second time baking these pastry. I lost the pictures from my first attempt when the notebook broke on Tuesday. There was no choice but to re-bake as I don’t want to miss the very first assignment! It helps that it’s a no-sweat recipe and can be completed in 40 minutes. Each time I baked only half the recipe. I used Gruyère cheese. I found that if I bake the gougères for 12 minutes after rotating the trays they are a nice golden colour but soft. If I baked them for 15 minutes they turn a darker brown and have a crunch like a crispy puff. Check out how other bakers did on French Fridays with Dorie.com.